Black Bean & Walnut Burger - Vegans Eat What? Vegans Eat What? 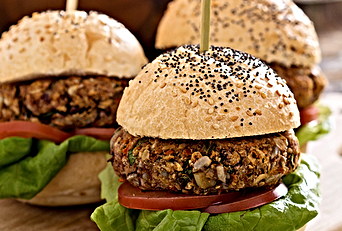 If you've been disappointed with black bean burgers in the past, this one will wow you and all who try it! Place the drained beans in a large bowl and mash with a fork. Place the walnuts, red pepper, carrot and onion in a food processor and pulse until mixture is blended (veggies finely diced). Remove the mixture from the food processor and add to the mashed black beans. Add all remaining ingredients EXCEPT the vital wheat gluten and mix until combined. Add the vital wheat gluten and, using your hands, work the gluten into the mixture for a minute or two. Form the mixture into patties and fry in a little oil in a pan or lightly brush both sides of the patty with olive oil and cook on a medium high grill turning once, until both sides are well browned. You can make these patties using canned black beans or homemade. This burger is great on a grill or cooked in a pan in a little oil. Serve the burger on a bun with all the fixings or in a lettuce leaf. This recipe is adapted from "Peruvegan" by Vicki Cosio (Vicki Cosio, 2014). I just tried these and they were great. Dave, I’m so glad you enjoyed the burgers! I often make a batch (or two) of the mixture on weekends for an easy meal during the week. Betty, Great question! Gluten is the protein part of wheat that gives bread it elasticity. Vital wheat gluten looks like a flour and is used to make seitan, breads and other baked goods. It is available in the health foods or natural foods section of most large grocery stores. You can also buy it in bulk online. We keep it frozen for longevity.